I had to do a complete reinstall of Windows 7 and lost Adblock. Is there a ad blocker that works on 2.49.4? 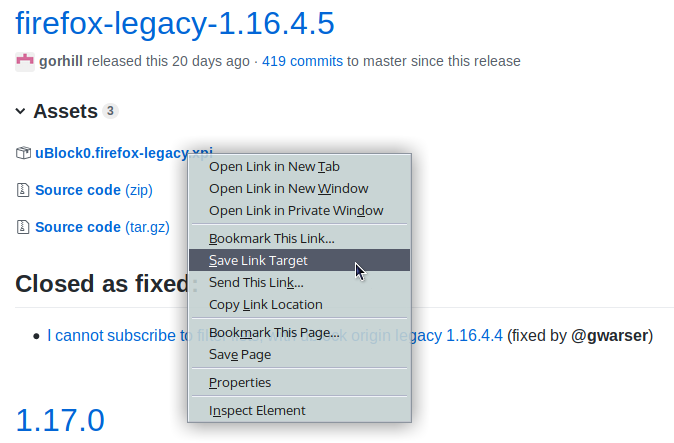 Look for the one that says "Firefox-legacy". I downloaded it but I don't know how to install it in seamonkey. I figured it out. Boy am I embarrassed! I just downloaded the latest version 1.17.3b1 for installation into Seamonkey 2.49.4 and the browser reported that it could not install after the download because the file was corrupt. Is anyone else able to install the current version? See the post and link by Anonimosity above. Version 1.17.3b1 will not work with Seamonkey. vtmozilla wrote: I just downloaded the latest version 1.17.3b1 for installation into Seamonkey 2.49.4 and the browser reported that it could not install after the download because the file was corrupt. SeaMonkey uses (as it should be) classic XUL/XPCOM extensions (> uBlock firefox-legacy-1.16.4.5). And it doesn't use that WebExtensions crap (> uBlock 1.17.2). Are we saying that the usual AdBlock Plus and Element Hiding Helper do not work with 2.49? That would be very, very bad. Anyway, in the past, ABP was a very good extension. But today is a piece of crap. BTW, anyone who has a minimum of common sense, uses uBlock Origin. It's the 4th one down v1.16.4.5 How can I save the file for a offline load? > How can I save the file for a offline load? Using the example in the previous post, the 1st link opens a 'Save as'. The 2nd link opens as a 'install software'. Neither have a 'save target as' in the right click menu (in SeaMonkey). videobruce wrote: Using the example in the previous post, the 1st link opens a 'Save as'. The 2nd link opens as a 'install software'. Neither have a 'save target as' in the right click menu (in SeaMonkey). It was unchecked (hidden) in the "Menu Wizard" add-on menu. Is there a "Ghostery" (tracking blocking) available for SM? I scanned thru 700 of the 700+ add-ons, but I didn't see it.